The natural park called Los Cerros de Alcalá, is the main green area in Alcalá. It is a great place for hiking or riding a bike without leaving the city. If you live close to the river Henares, you have probably noticed the small hills without urban development on the other side of it. This is the natural park called Los Cerros de Alcala, and it is the main green area in the city (which is not to say much though, since Alcala has a general lack of green areas). This natural park, which stretches over 806 hectares (1 hectare is approximately as large as a soccer field), is both the result of the erosive action of the river Henares and the action of man. The hills were deforested by the population of Alcalá in order to use the wood for cooking and heating, which enhanced the erosion of the hills. To avoid this, several areas of the park have been replanted over the last decades. Other parts of the park were used for harvesting, and there was even a large landfill, which was closed several years ago and covered with earth and replanted to recover the area. 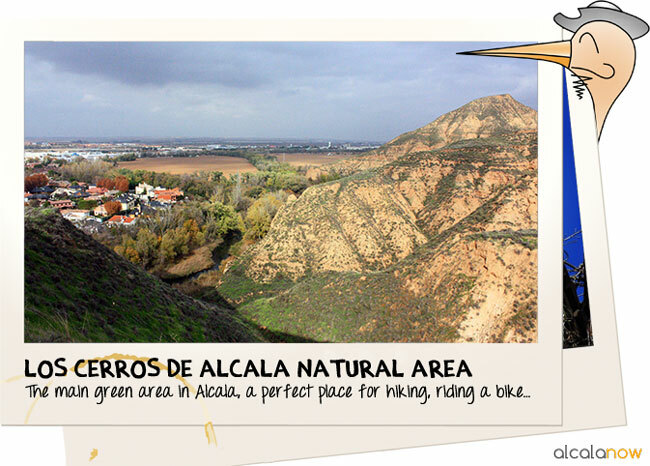 What to visit in Cerros de Alcala Natural Area? 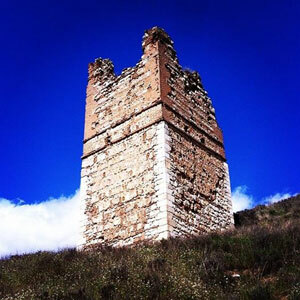 During Ninth century, in the muslim period of Alcala, a small defensive tower was built on top of one of the hills, which later developed into a larger fortress. Those were hard times for living in Spain due to the constant raids and fights, and therefore the inhabitants of Alcala abandoned the old roman settlement (Complutum), for the safety of the hills and the fortress. In fact the name of Alcalá, derives from the arabic Al-Qalat (fortress). You can still visit the ruins of the fortress, although, in our opinion, they are not very well taken care of. If you hike or ride your bike in the park you will notice the large amount of caves, some of them were used for harvesting mushrooms (you can still see paint on the cave walls signalling the harvesting time) or as temporary shelters during the Spanish civil war. If you are lucky, you can even become rich on your visit to the park! As the legend goes, one arab ruler hid his treasure in one of the caves, before departing south due to the christian reconquest. Suggested routes. Source: Guia breve de los Cerros de Alcala, Ayto. Alcala de Henares. There are many paths in the park on which you can hike or ride a bike, and there are even some suggested routes. This is the easiest and shortest route. It goes through a former landfill, the Henares river, its river beds, small canyon walls, pine woods and tamarix woods. It starts and ends in the red route, but it goes deeper into the replanted pine woods. The bird life in the woods and the view from “Mirador de la Puerta Verde” are really interesting. This route goes up to the remains of the fortress of “Qal’ at’ Abd-Salam”, which was built in the 9th Century. From this fortress, there is a beautiful view of Alcala and the Henares river. 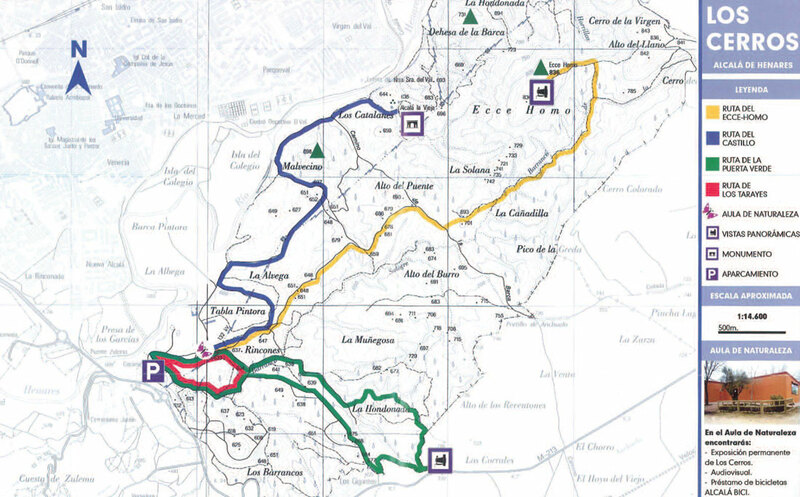 This route goes up to the Ecce-Homo hill or “pico de la Vera Cruz”. The view from here is fantastic: you can see Guadalajara, Somosierra or Madrid, and Alcala de Henares. You can find all the information in this pdf from the City Hall of Alcala, or in this website. In the tourist office, you can also find information and some small plans about the natural park and routes. The team of AlcalaNow hiked a small route some days ago, and had a wonderful time in spite of the cold! We hope you do too!